there is always the soul of who is there to give you such a service. To be the manager of a hotel in Milan fashion district is a demanding role, with many different shades and emotions, that first of all requires good skills and professionalism. Nevertheless, the unmissable trait of this job seems to be Passion. It is indeed such indispensable element to make of Hotel Manzoni, not only a hotel of Milan city center, but also a real house for all the travelers looking for elegance, kindness and relax. We believe that the best way to make this concept clear, is to speak directly with who does the honors: our hotel manager Giulio Marcucci. Good morning Giulio, what about telling us in few words how you ended up here at Hotel Manzoni with such an important role? Of course. My path has been an old style one: school of hotel management, lot of practice in simple restaurants of my town, till ending up working for prestigious facilities in Switzerland. After becoming head waiter, around my 20s, I decided to change into a front office role… from the backside door, as night porter. After a year, thanks to a series of lucky events, I had the chance to work first in Administration and after that in the HR. In the meanwhile, I took an interest in sales. 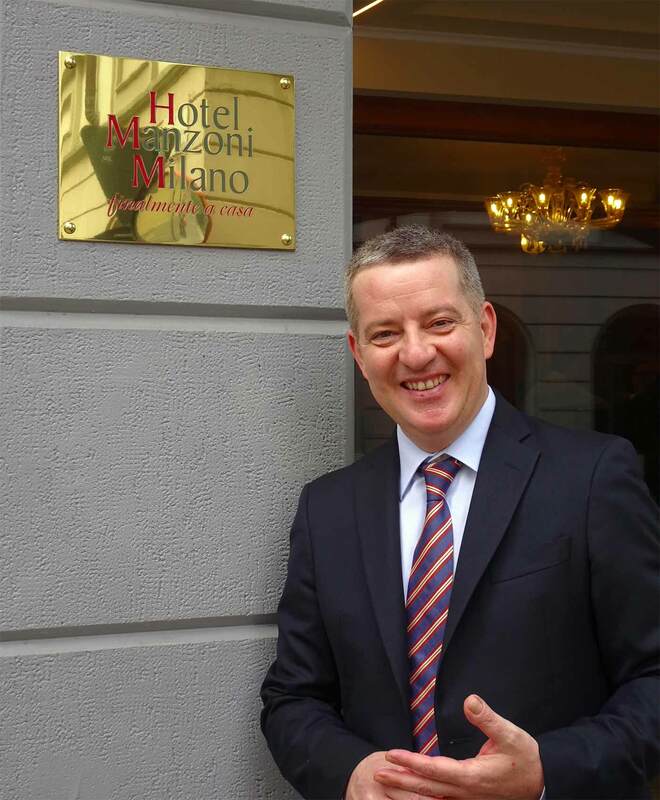 Then, I became personal assistant to the general manager arriving at the top position in 1999, at the Hotel Poliziano Fiera of Milan, and from 2002, finally home, here at Hotel Manzoni. What is Hotel Manzoni representing in a city such as Milan, and an area like this, the fashion district!? It simply wants to offer the possibility to finally feel like home, far away from your real home. The fact to be located at the center of the fashion district, for us is reason of bigger effort. Our guests love Beauty, they are very demanding and used to travel a lot, that means they are able to value the quality of the hospitality they experience. What can you expect as guest of the hotel Manzoni, what atmosphere, what kind of stay do you try to offer to your guests? What you can expect, with a good quality price ratio, is a safe place where to land, made of professionalism mixed with the warm welcome of all my colleagues. A relaxing atmosphere, simple in its elegance and sophistication, where calm lies steadily. The relationship with the team is one of the success keys of every business, how do you experience it and what requirements are you looking for in the people working with you? The relationship between colleagues is at the base of our success. My colleagues are professional hospitality people, doing their job with passion, always putting the guests at the center, through the attention to the detail and small adjustments that make our guests feel home. What I look for in my collaborators, is that sense of warmth and love for hospitality that is more and more a rare quality. How is your bond with Milan and its people? I am just “borrowed” by the city. I live in Brianza, in a quiet and green area. My area of decompression!!! We can say it is Milan that welcomes me every day, with its efficiency, its cleanliness, and its extraordinary welcoming way of being, indeed. Milanese people instead are always a little bit rushing, but full of energy and desire to do and share their experiences. Is it there a moment you consider more delicate during your daily work? The most delicate moment for me is to deal with possible inconvenient situations that our guests experience during their stay here. Luckily it seldom happens, but sometimes it show our inefficiencies, even if at the end it is a way to push us to do always better. What is the most satisfactory part of your profession? I live of human relationships, on all levels. With the institutions, more or less known characters, amazing colleagues, and serious and professional commercial partners. Why would you suggest Milan as travel destination?